Ahead of the implementation of the Tax Stamp Policy by March 1st, some local manufacturing firms- Coca Cola, Bel-aqua have also expressed concern about the policy saying they are not prepared to start. In fact, local manufacturing firms are having challenges purchasing the affixing machine which the government directed under the new policy order. A visit by JoyBusiness to the factory and warehouse of Coca-Cola Bottling Company show that the company is yet to purchase an affixing machine. Head of Corporate Affairs at the Coca-Cola Bottling plant at Spintex in Accra, Bethel Yeboah told JoyBusiness, his outfit is still engaging government for a reconsideration of the tax stamp policy. "As it stands now, we do not have an affixing machine, our bottles do not have the stamps affixed to them. We are not ready for the policy," he stated. The Coca-Cola Bottling Company is one of the largest local manufacturing companies in Ghana, producing close to 100,000 cartons of bottled soft drinks into the wholesale and retail market. Just like them, several other local manufacturing firms would have to work out ways of injecting about $600,000 to $800,000 on investments and installation charges for the affixing machines. The implementation of the excise tax stamp policy continues to generate much controversy as industry players in the manufacturing sector are making a case for the policy to be first tried on imported products before a complete rollout extending to local companies. The Blow Group of Companies, producers of BEL-AQUA Mineral Water say the complete shutdown of their plants at Tema Industrial Area will form part of strategies to cut down on cost. Chairman of the Blow Group of Companies, Manoj Lakhiani, told JoyBusiness, the company will have to invest over $800,000 on investments and installation charges for the affixing machines. "We can't meet the requirements, we are considering shutting down our plants, the policy will not favor us. Why is the policy covering bottled water and not sachet water," Manoj Lakhiani said. 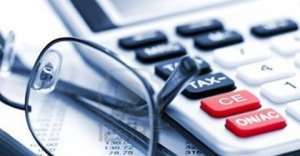 So far, the government has threatened to sanction businesses that fail to comply with the March 1st deadline for the implementation of the Tax Stamp Policy. 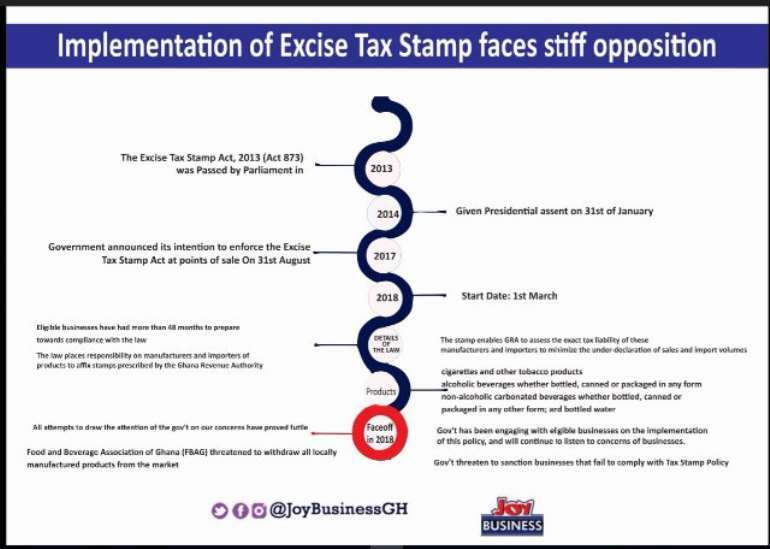 Also, the Food and Beverage Association of Ghana (FBAG) threatened to withdraw all locally manufactured products from the market if the government goes ahead with the implementation of the Tax Stamp Policy on March 1st. Meanwhile, checks by JoyBusiness show that no beverage manufacturer, including Guinness Ghana Breweries Limited, Kasapreko Company Limited, Voltic Ghana Limited, Accra Brewery Limited, Pepsi Ghana Limited and Coca-Cola Bottling Company Limited, had procured or installed the tax stamp affixing machine needed for the smooth enforcement of the policy. This development raises questions about the ability of the country to start the enforcement of the tax stamp policy meant to keep proper records of the production of bottled beverages and water for the purposes of tax collection.